"Big Pimpin'" is the last single from rapper Jay-Z's fourth album Vol. 3... Life and Times of S. Carter. It features rapping by Southern hip hop group UGK as well as production by Timbaland. Timbaland samples "Khosara", composed by Egyptian composer Baligh Hamdi in the mid-20th century and originally recorded by the famous Egyptian vocalist Abdel Halim Hafez for the track's beat leading to its Middle Eastern sound. A version of "Khosara", arranged and performed by Hossam Ramzy, can be heard on a CD compilation entitled, “The Best of Bellydance from Morocco, Egypt, Lebanon, Turkey” which also contains another song that Timbaland sampled for the Petey Pablo track, “Raise Up”. In 2007, the song sparked controversy when a copyright co-owner of the stolen track Osama Admed Fahmy filed a lawsuit in Los Angeles Federal Court, objecting to the fact that Timbaland illegally replayed portions of "Big Pimpin" note-for-note, using a melody lifted from the song. Jay-Z, Timbaland, Linkin Park and EMI Music Inc. were among the defendants named in the lawsuit. (Linkin Park because the track was also mashed up with their song Papercut on the collaborative EP Collision Course in 2004). This latest lawsuit follows an August (2007) decision by a California judge to dismiss another lawsuit by Ahab Joseph Nafal, who claimed Big Pimpin' infringed the copyright of Khosara, Khorasa. Lawyers for EMI Records argued the 50-year-old track was governed by the 1909 Copyright Act, AllHipHop.com reports. 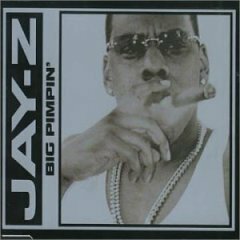 "Big Pimpin'" is the most commercially successful single from Jay-Z's fourth album as it reached #18 on The Billboard Hot 100 and #1 on the Rhythmic Top 40 chart. The music video was shot in Trinidad during its Carnival and features Jay-Z on a music truck throwing money into the crowd and partying on a lavish yacht. It was directed by Hype Williams. The song was listed at #31 on Pitchfork's top 500 greatest songs of the 2000's. 1. "Big Pimpin' (Radio Edit)"
2. "Watch Me (LP Version)"